Just returned from a wonderful trip to Long Island. So....I board the LIRR(train)for my journey back to the city, and choose a seat next to a man that instantly looked familiar to me. I keep sneaking peeks at him,nope can't place him. As we exit the train I see he has a camera strapped to his back, and at that moment I realize who I have been sitting next to! 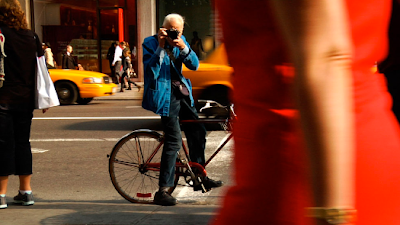 The one and only Bill Cunningham! Wearing the blue jacket, reading the New York Times....how could I have missed it?!? Damn!!! !